Having trouble finding the perfect combination for your bathroom vanity? Luxury Living Direct now offers another way for you to customize your vanity. If you have found a vanity in our shop but you want to switch out a part, here’s how you can do it! Let’s say you found the almost perfect vanity but you want to swap out the countertop for a different one. Or maybe you don’t want a mirror option that is included in the set. We can help you with that! Just provide us the main SKU or Model Number and the details of the part you want to switch out. Figure out if you want to swap out a part for another part. Determine if you want to remove any existing parts from the set. 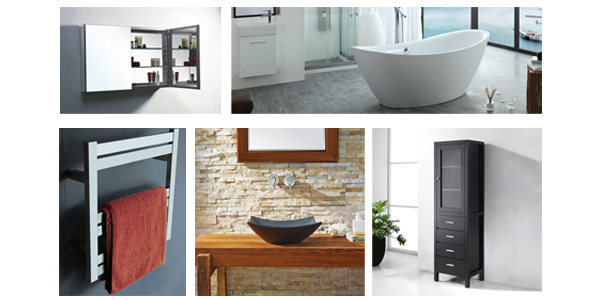 Finish personalizing your bathroom look with our extensive collection of bathroom furniture. There are many different combinations of vanities to choose from and it might not currently be available in our shop. Match your bathroom vanity to your bathroom design without worry! Fill out the form below we will get back to you with a quote within the same day. Email sales@luxurylivingdirect.com We’ll email you back with a quote the same day. Call (800) 574-3022 and talk with our friendly representatives about placing an order. Once you’ve emailed or filled out the form, we will either email you back or call you to confirm the final details of your order. Please Note: We cannot alter finishes and colors for any part. This service is only applicable to modifying final parts of Virtu USA bathroom vanities. Ready to Customize your Vanity?